Google Blogger added new feature - "Follow your favorite blogs"
On 10th September, 2008 Google Blogger Team introduced a new feature for Blogger user's "Follow your favorite blogs" that lets you easily follow your favorite blogs and tell the world that you’re a fan. Many Social Networking web site's like BlogCatalog, Stumbleupon offers such community building service to online users. Mybloglog (YAHOO) pioneer in offering this facility where mybloglog users can show up their community and follower's by displaying Mybloglog Widgets on website/blog. Micro-blogging site Twitter also shows up such statistic's on Number of Follower's, Number of people you are following on and your tweet updates. Good to hear that Google has realised potential of Web 2.0 and by adding new feature "Follow your favorite blogs" on Blogger indicates that Google team is moving towards social networking. 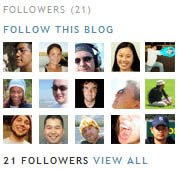 To follow a blog with the Followers' Gadget, simply click the “Follow This Blog” link. You can show your support for the blog by following it right from your Blogger Dashboard or in Google Reader. Following isn't just for bloggers, it's also designed to make it easier for readers to keep tabs on their favorite blogs. In addition, you can easily check out what blogs other fans are writing and following - you might even find another blog you’ll want to add to your reading list. And by the way, you can follow any blog, even if it isn't hosted on Blogger or doesn't have the Followers gadget. Just go to your Reading List in your Blogger Dashboard, click the “Add” button, and type in the blog’s URL. And you can even import existing subscriptions from Google Reader. Search engine optimization (SEO) is the process of improving the volume or quality of traffic to a web site from search engines via "natural" ("organic" or "algorithmic") search results. SEO tool collects search terms from more than 180 search engine. It has a large database that covers over 600 million results.